When faced with difficult life events, finding the time for self-care and rejuvenating activities can feel impossible, but they are important tools in recovery. In supporting Gifts of Light, you are helping CAMH patients participate in Feel Good Fridays and enjoy the revitalizing effects of a fresh haircut and manicure. For the CAMH patients who participated in a Feel Good Friday program, the salon experience was a great way to feel revitalized. Patients were offered the works, including a wash, cut and blow dry, and full manicure and pedicure. While not everyone opted for the entire package, patients left feeling refreshed and reinvigorated. Patients were supportive of one another too — some going out of their way to convince their friends to try a manicure or pedicure for the first time, or to help each other select a hairstyle from a magazine. For one participant, a patient at CAMH for ten years, this was her first experience with Gifts of Light’s Feel Good Friday. Patients don’t go away empty handed. “We supply everyone with a takeaway bag — a little gift bag of hair and nail products as a takeaway for our patients, containing items from the Gifts of Light store which are put together by volunteers prior to the event,” added Quinn Kirby, Program Manager with CAMH’s Gifts of Light program. 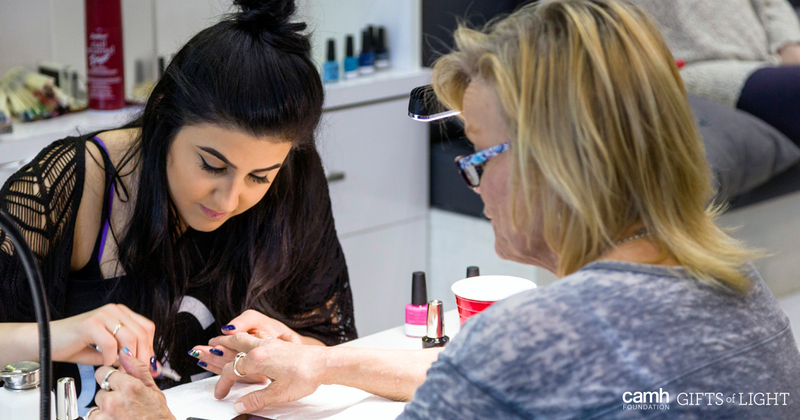 Another CAMH patient was eager to share her experience while waiting for her nails to dry. While she’s only been a patient for five months, she felt fortunate for the opportunity to attend and had a great time at the salon. Purchase a Feel Good Friday gift today and help someone in need feel their best.